Quality, therapeutic concentration, and affordability of nutritional products makes all the difference! Excelsior Alchemy™ is a Plant Strong, Vegan, Organic, Kosher, Gluten-Free, NON GMO, NSF Verified SuperFoods manufacturer and packer, with specialty in botanicals, herbs, and superfoods in whole and extracted form. All ingredients are lab verified. We source, test, blend, encapsulate and package a variety of whole food superfood formulas. We have our own line of select organic single superfoods only available at our Organic Vegan Super Store. 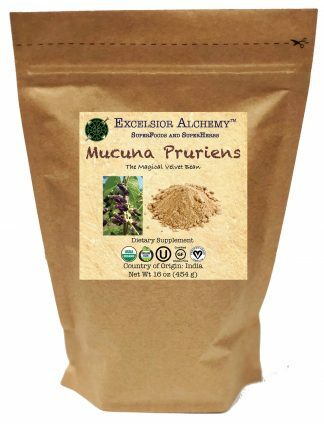 Excelsior Alchemy SuperFoods and SuperHerbs: Certified Organic, Vegan, Kosher, Gluten Free Reishi, Ashwaghandha, Hemp Hearts, Moringa, Maca, Cacao, Lucuma, Turmeric. 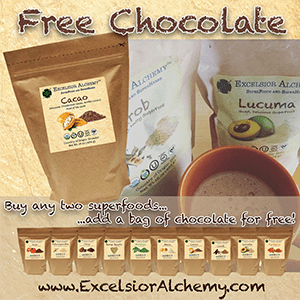 …and add a free bag of cacao!